"Colors Come Alive" Galaxy28 is a designer favorite. Galaxy28 polymercized fabric banners are very popular large modern printed fabric exhibition wall displays and covers. The special fabric is a super white and smooth and uses a proven sublimation process giving the ultimate contrast of color. It is the most vibrant color result of all printing table cover material. It looks beautiful. Galaxy28 is the brightest fabric printing material available. Display wall, stretch and cover graphics, step n repeat, marquee liners and corporate displays. Choose Hook or Loop for rear attach table surround. Convention and Trade Show Services. Also used for corporate draping and media wall backgrounds. 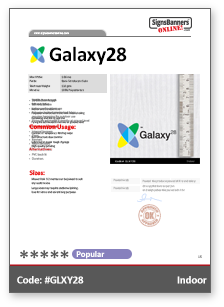 Galaxy28 is full height full color graphics. Excellent graphics and color definition. Equally suited for No or Illuminated graphic media.. Using Dye Sublimation Fabric Printing (gaseous ink systems) for printing printing the fabric is ideal for clients who want brighter colors, deep ink setting and smooth vignette graphics on their media. 28 is superb for fashion photos and high resolution photo banners. 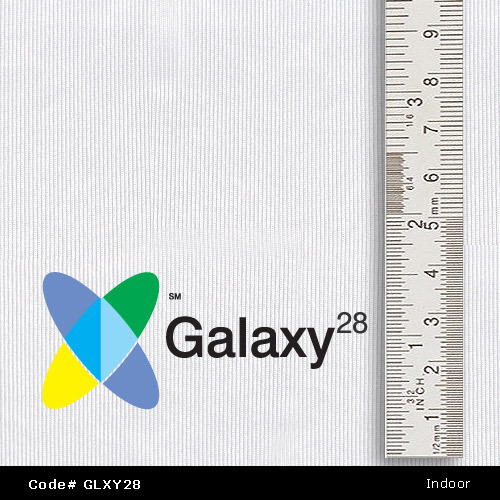 All purpose (small to medium sizes only) Galaxy28 is well used for trade show graphics, weddings, sign in tables and more. The TOP BACK HEM can also have HOOK or LOOP attached for convenient fitting to your frames. #2 Cleaning: you can clean the surface with luke warm water, soap and cloth. Material can be washed. #4 Sizes: Suited to Maxi or large sizes. Double sewn PLAIN JOIN used for maxi sizes. #5 This is a shiny material. Comparison Galaxy28 offers a 'shinier' finish. The shiny whiteness influence makes colors appear brighter. Display Chief is 'non glare matt'. #1 Medium to Large sizes: Max no join height = 10 feet 6" (3100mm). #2 No mimimum dimensions, Medium roll length. 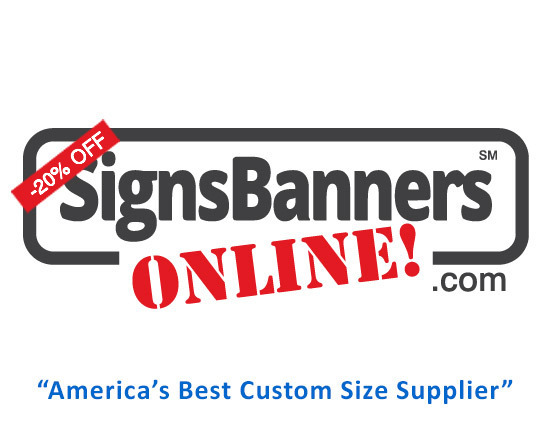 Use for presentation flags, soft signage, printed drapes and conference liners and general sign printing.